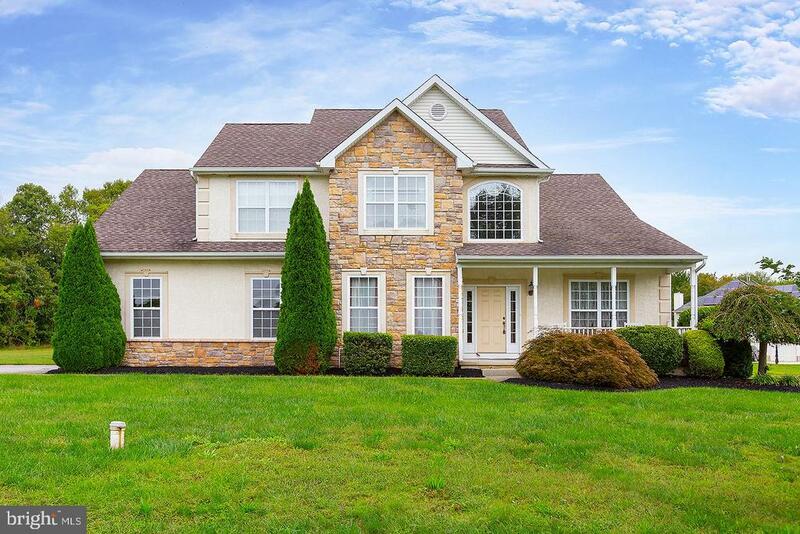 All Woolwich Twp homes currently listed for sale in Woolwich Twp as of 04/22/2019 are shown below. You can change the search criteria at any time by pressing the 'Change Search' button below. If you have any questions or you would like more information about any Woolwich Twp homes for sale or other Woolwich Twp real estate, please contact us and one of our knowledgeable Woolwich Twp REALTORS® would be pleased to assist you. "New Construction on this BEAUTIFUL 1.54 acre cul-de-sac lot in The Preserves. Nocentino Homes are unmistakable, the meticulous attention to detail and fine quality craftsmanship make every one of our homes stand out. Each and every home is different. We make building homes exciting and easy. Our customers begin by choosing one of our many floor plans, and if changes are wanted, it's never a problem. Guiding our customers through the process of making changes to floor plans and designing their own homes is what we do best. There is nothing Builder's Grade in a Nocentino Home. Some of our quality features include 9FT ceilings and 8FT estate height doors on the first floor, rounded drywall corners, open floor plans, perfectly designed archways and stately columns. Make your home a showpiece with our outstanding windsor trim designs and handcrafted oak staircases. Visit our design centers and a design specialist will help you choose every facet of your new home. Our kitchen designers will assist you in designing your Dream Gourmet Kitchen. Choose your cabinets, center island layout, granite, hardwood flooring and light fixtures. All floor plans include 2x6 exterior walls, 3 Car Garage, 2 Zoned HVAC, Full Basement 9FT Superior Wall System All floor plans include 2x6 exterior walls, 3 Car Garage, 2 Zoned HVAC, Full Basement 9FT Superior Wall System. NO LOT PREMIUM ON THIS LOT! Home To Be Built. Photos are of finished homes to for example." "Live above your expectations with this gorgeous Livingston Expanded Model located on one of the best lots in this exclusive, upscale community!Situated at the end of a quiet cul-de-sac, backing to trees and graced with an elegant stucco front elevation,this home also boasts a 3-car side entry garage with upgraded garage doors.This gorgeous home boasts a full daylight, partially finished basement with full size windows,9' ceiling height and a 3 piece rough-in for a future full bathroom in the basement!This home has a 2-Zone heating system, an unbelievable Estate Room addition and a sunken family room with stone fireplace(full brick chase on exterior).Elaborate lighting throughout both exterior & interior including:Christmas light package,recessed lighting,gorgeous fixtures w/medallion mounting bases and tasteful landscape lighting as well!Hardwood flooring through the foyer,hallway,powder room,continuing up the curved oak staircase in addition to the hardwood hallway upstairs! The huge kitchen has upgraded cabinets, a new floor, granite counter tops and a massive center island, all attached to the sunny breakfast nook. There is crown molding in many of the rooms. The backyard is paradise with a hot tub and in-ground salt water Gunite Pool with a 8 sun pad with surface jets and a rock waterfall. There is tons of storage with the garage, full basement and outdoor shed. Located close to area bridges, the NJTPK and Rte 295, commuting is a breeze from this tremendous neighborhood. Your dreams can come true with this truly exceptional home you would be proud to own. Most furniture will be available to convey with this home." "Look no further! A rare opportunity to own a true luxury style home, in a unique location, and at an amazing value. In considering Woolwich Township, you're already aware of the phenomenal schools, proximity to major roadways, and affordable cost of living. You may also know that the 08085 zip code was ranked 5th overall in a nationwide ranking of Top 10 Affordable, 'Youth' Friendly Suburbs That City Parents Won't Hate. 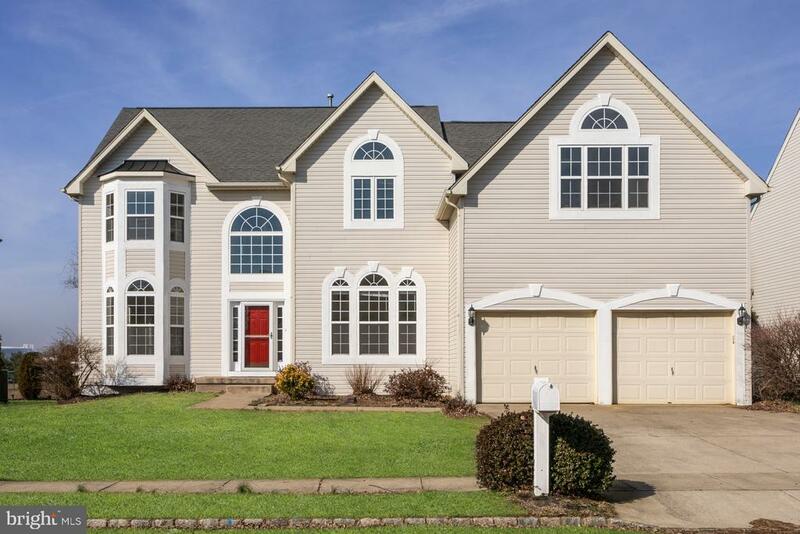 Located north of route 322, you'll have unobstructed access to 322, 295, and the NJ Turnpike (you'll even be walking distance to Kingsway Regional Schools). Arriving on Casella Way, you'll instantly appreciate what sets this community apart from others as every home is its own masterpiece and pride of ownership is evident at every door step. Entering through the impressive two story-foyer, you'll immediately be captivated by the size and depth of this home. To your left there's a formal living room complete with crown molding, decorative wainscoting, and a bay window. To your right, the expansive formal dining room can easily accommodate crowds of any size. Moving through the dining room places you in the extra large eat-in kitchen. This contemporary space is bright and uplifting with neutral colors, granite counters, abundant counter/cabinet space and plenty of natural light. Open to the kitchen is the great room. Highlights include a dramatic vaulted ceiling framing the entire room, a gas fireplace, and great functional space. Off of the great room is the study/home office; while being it's own separate space, you'll enjoy the best of both worlds by remaining close to the main areas of the home. Moving upstairs, the master suite is beyond compare and better described as a home within the home. It's complete with a generously sized sitting area, walk-in closets, jetted tub, dual vanities, and so much more. 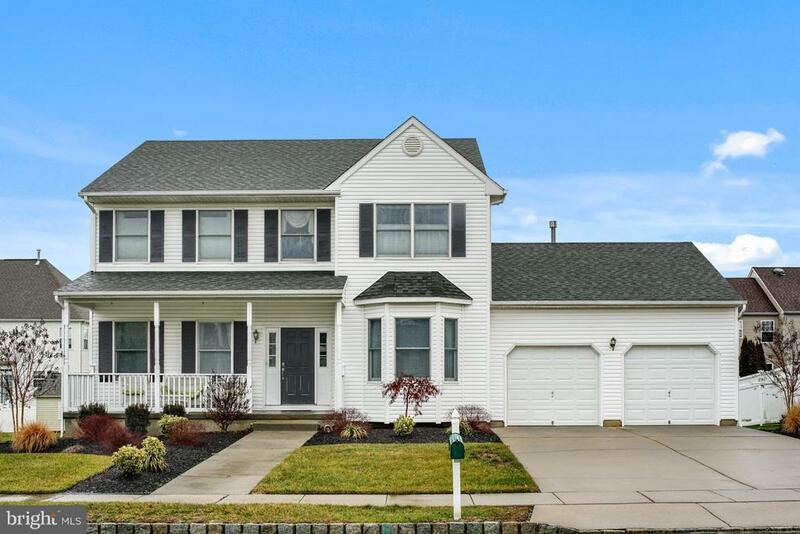 Rounding out the second floor are 3 additional bedrooms, a second full bathroom, and a walk way overlooking the great room.~ Additional interior"
"Welcome to Woolwich Township-South Jersey's best kept secret! This 4 bedroom, 3 full bathroom, and 2 half bathroom home is nestled in the community of Blue Spruce Estates with a BRAND NEW renovated first floor and kitchen! The 2-story foyer with tile flooring welcomes you inside. The living room features cathedral ceilings, chair rail, hardwood flooring, and architectural details. The formal dining room features hardwood flooring, crown molding, wainscoting, and gorgeous chandelier with medallion. The renovated gourmet kitchen features custom cabinets, granite counters, glass tile back splash, walk-in pantry, large center island, gas cooktop, double wall oven, stainless steel appliances, wine refrigerator, and upgraded light fixture. The breakfast area features upgraded light fixtures, a custom breakfast bar with seating, and a sliding glass door leading to the deck overlooking the yard. Enjoy relaxing in the spacious sunroom with cathedral ceilings, tile flooring, ceiling fan, and a sliding glass door leading to the deck. There is a home office ideal for the work from home employee or a separate working space. The second level features the master suite with en-suite bath, 3 additional spacious bedrooms with neutral carpeting, a jack and jill bathroom, and a full bathroom. The master suite features tray ceiling, upgraded lighting fixtures, sitting area, neutral carpeting, and a walk in closet. The master suite features a double bowl sink, upgraded light fixtures, soaking tub with tile surround, and a stall shower. More living space can be found in the FULLY FINISHED basement featuring a large space ideal for an additional family room, entertainment space and/or play room, additional room perfect for an exercise area, and a bathroom! Woolwich Township is close to major commuting routes, only minutes away from Philadelphia and Delaware, and shopping, restaurants, libraries, parks and recreation, and more! Great schools and location!" "$1000 Towards Buyer's Closing Costs! Quick possession! 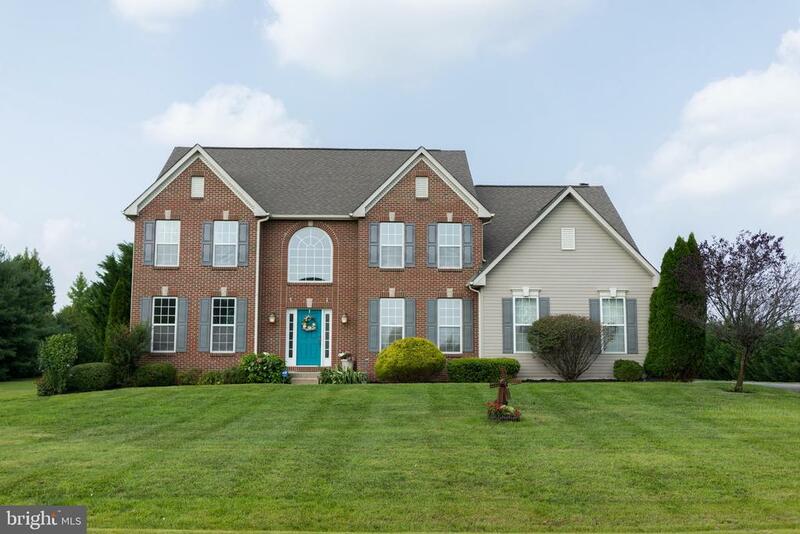 4 1/2 bath 4 bedroom elegant 3,694 square foot home plus full extra high ceiling basement finished into a theater room, game room with wet bar, full bath & exercise room. 9 foot ceilings and soaring vaulted ceiling in family room looking up to 2nd floor bridge. 2 sets of stairs to 2nd floor, bright & airy sun room, first floor study with french doors, 2 zone heat & air, Luxury master bedroom suite with sitting area, columns, Jacuzzi soaking tub & cathedral ceiling. Giant 1 acre corner lot featuring a full court basketball court, 2nd floor trex style deck, shed, lawn sprinklers on all 4 sides. Low maintenance exterior with stucco front & capped soffits & trim. More features include security system,full bath in 2nd bedroom, walk in closets separate electric for the finished basement, Butlers pantry & gaslog fireplace in family room, dry walled garage and so much more!" "This gorgeous home is nestled on a 1.6 acre lot. The grand foyer features an elegant sweeping staircase, Brazilian Cherry hardwood floors, shadowbox molding and a soaring two story ceiling. The formal living room has BRAZILIAN CHERRY HARDWOOD floors, chair and crown molding. Holiday meals will be a pleasure in the spacious formal dining room. Crown and chair rail w/shadow box detail creates a wonderful backdrop for holiday meals & entertaining friends. Even the most discerning chef will appreciate the gourmet kitchen with 42 maple cabinets with a warm cherry finish, a huge pantry, tumbled stone backsplash, GRANITE counters, a five-burner gas cooktop w/ a stainless steel tile backsplash and STAINLESS STEEL APPLIANCES. Keep the cook company at the center island or grab a quick snack at the huge clever peninsula. Don~t you LOVE the gorgeous custom tile floors? The large sunny breakfast room provides great space for every meal. From your first cup of coffee to your midnight snack~this gorgeous kitchen is the certainly the center of activity in the home! Open to the kitchen is the sunken family room. This sunny expansive room has a large bank of widows providing tranquil views of the huge private backyard and a convenient back staircase. On chilly nights curl up next to the cozy gas fireplace and sip a glass of wine. This is the good life! The fireplace is two sided~sharing the warmth with the breakfast room. Tucked away in a quiet corner of the home is a spacious office. The office has a double closet and connects to the first-floor full bath so if you need a first floor bedroom suite, this is perfect!!! The master suite offers a large bedroom with a tray ceiling, a huge walk-in daylight closet (how cool is that?!! ), a pretty sitting room and a lavish master bathroom. At the end of the day lock the door and pour a relaxing bubble bath. You deserve this! The additional bedrooms are spacious and have generous closets. Bedrooms 2 and 3 share a JACK-N-JILL BATH with pocke"
"Hickory Elevation 1 - Quick Delivery Home - 4 Bedrooms 2.5 bathrooms and 3 Piece Rough In for future full bathroom in basement. Home features volume tray ceiling in Family Room, Gas Fireplace, Double Staircase plan with Oak Treads and Painted White Risers. Magnificent Owner's Suite with massive WIC and ensuite bathroom. Kitchen features granite, gourmet kitchen layout with GE Profile Appliances, Open concept layout. 2 Car Side Entry Garage. Full 9' High Basement. Still time to choose your interior options, finishes, and exterior colors." "MOTIVATED SELLER will entertain any reasonable offer on this meticulously and lovingly maintained single. There has been ONE OWNER for this home. Enter the stunning 2-story center hall, walk across the NEWLY REFINISHED HARDWOOD FLOORS and NEW CARPETING. Walls have been FRESHLY PAINTED creating a perfect palate for your designer touch. There is plenty of detail including chair rail, shadow boxes and crown molding. The main level features a private study with double door entrance and a great size living room that is connected to a formal dining room. The eat-in-kitchen features 42~ cabinetry, hardwood flooring, an island, double sink, and overlooks the family room creating a perfect OPEN FLOOR PLAN for families with young children. The owner is willing to offer sellers assist for new appliances. The family room features a FIREPLACE, VAULTED CEILINGS, large windows and recessed lighting. Also on this level is the laundry area, half bath and 2-car garage. The upper level features 4 very spacious bedrooms and 2 full baths. The HUGE MASTER BEDROOM features a double door entrance, tray ceilings, walk in closet, master bath suite with double sinks, large tub and stall shower. There is a full, clean, and dry unfinished basement that goes the full length of the home.Basement walls have been insulated, there is a newer water treatment system, and a NEW HOT WATER HEATER. 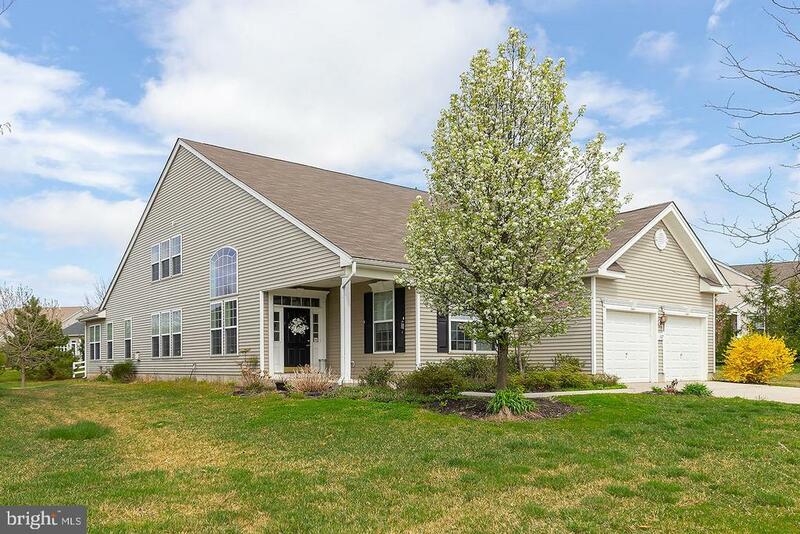 Once you have enjoyed viewing what could be your new home, go through the sliding door from the kitchen to access to the rear yard, sit in your large PAVER PATIO area, and enjoy OVER 2 ACRES of flat picturesque tree lined landscape!" 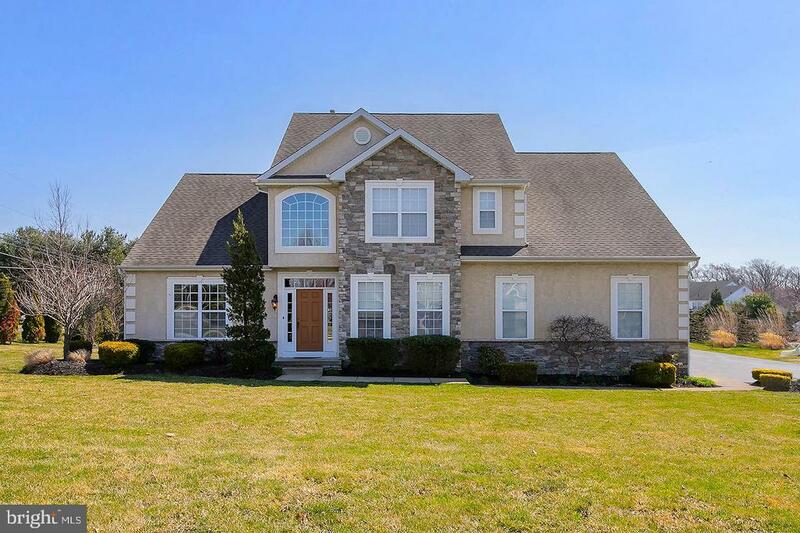 "Luxury living in a serene setting, just a half hour from Philly! Just 16 years young, this home is ideal for those desiring an almost-rural lifestyle with the convenience of a suburb. Beautifully maintained (by owners who don't wear shoes in the house! ), freshly painted and pristine, this home defines turn-key. The high ceilings and open floor plan on the first floor lend themselves to entertaining at its finest. In the warmer months, invite your friends to sip cocktails on the immaculate and maintenance-free deck, relaxing in the peace and quiet that an acre of land afford. On game days or movie nights, head down to the fully finished basement, complete with wet bar, to snuggle up near the fireplace or enjoy your favorite Netflix show in this cozy setting. The basement adds an estimated 1000-1200 additional square feet of finished recreational space! Retire upstairs, where all four bedrooms are in flawless condition--blank canvases for however you want to decorate. 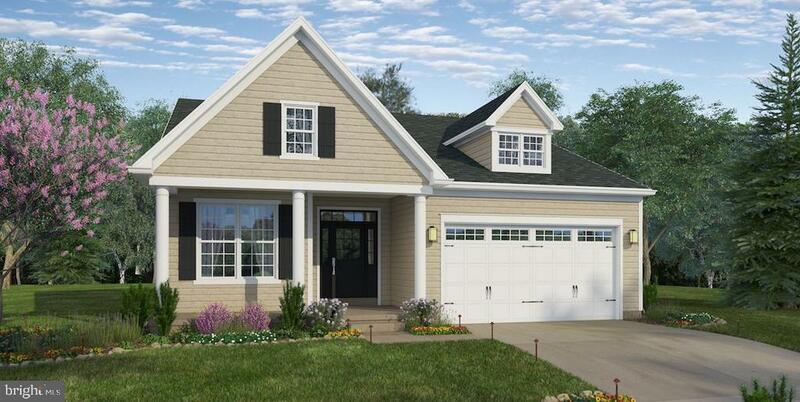 Three-car garage is suited for parking or storage for your riding mower and outdoor toys, and the driveway provides an additional abundance of parking for guests. Large enough to satisfy your needs, but modest enough not to have you dusting and scrubbing 24/7, this home is ideal for those wanting a peaceful, suburban setting without the maintenance and hassle of a larger home on multiple acres. Luxury meets modesty: schedule your showing today." "Exquisite & eye-catching with BEAUTIFUL FULL FINISHED BASEMENT. 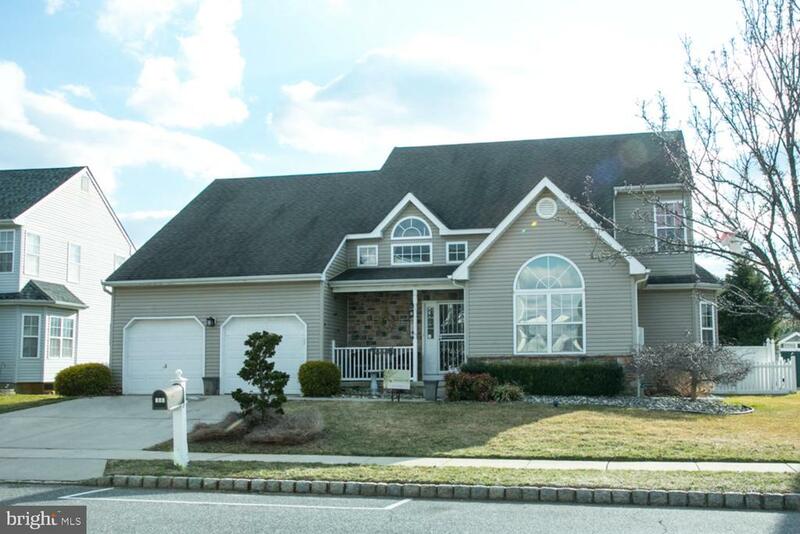 4 bedroom Colonial in mint move-in condition now available. Beautiful all vinyl exterior. The foyer area with hardwoods and cathedral ceiling greet your entrance. Relax in the family room with vaulted ceiling, skylights and fireplace. The kitchen offers a sparkling ensemble of granite counters, island, tile backsplash, tile floor, double convection oven. Private 2nd staircase from kitchen to 2nd floor. Convenient 1st floor office and powder room. Adjoining living room and dining room with chandelier. Sliders offer an easy path to the rear patio. The Master bedroom is complete with vaulted ceiling, skylights, sitting room, numerous walk in closets, large bathroom with double vanity, separate stall shower and soaking tub. 3 addl bedrooms & full bathroom complement the 2nd floor. The gorgeous basement is fully finished with 2 separate rooms for your entertainment. Listing agent has ownership interest in property. 2 zone HVAC. Attached 2 car garage with automatic openers. Minutes to 295 & NJ Tpk and shopping. All for you, the next owner." "McKee-Weatherby LLC. NEW HOME CONSTRUCTION. Quick Delivery NEW Home - ready for you today. 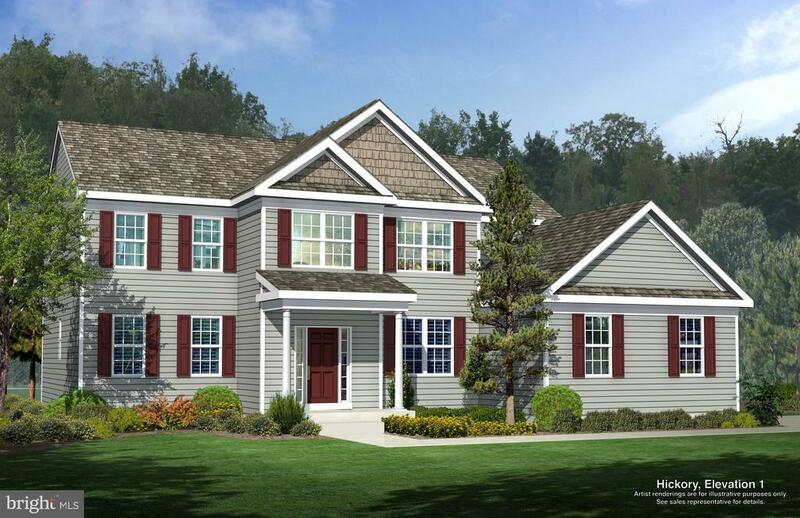 Welcome to The Preserve at Weatherby, McKee Builder's 55+ community located in Woolwich Twp, NJ. 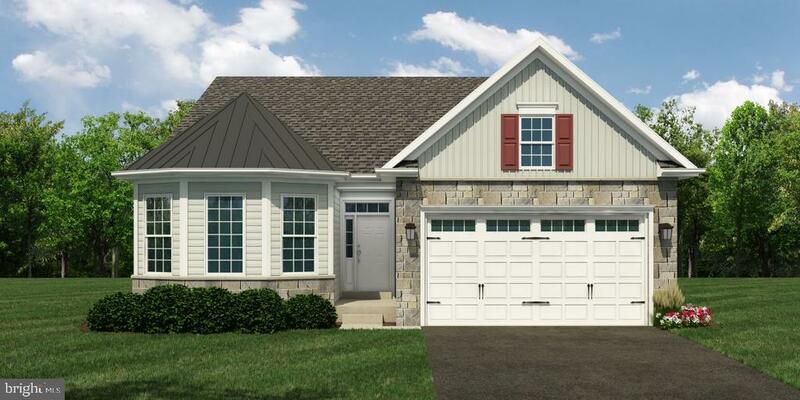 This new home The Jaxson is a 2 bedroom, 2 full bathroom that includes a first floor master suite, an unfinished basement, 2-car garage, a screened porch, an attractive stone water table at the front of the home and granite countertops in the kitchen. This finished home is situated on a premium lot that backs up to open space and is ready for you to move in and make it your own today! Our magnificent Clubhouse is situated in the heart of this thriving and vibrant gated community. Come and see just how wonderful it is to own a McKee Home. Model home hours: Monday, Tuesday, Thursday, Friday, & Saturday - 10:00am-5:00pm & Sunday from 12 noon-5:00pm - Please note that we are closed on Wednesday. Call appointment phone number for additional information." "McKee-Weatherby LLC. NEW HOME CONSTRUCTION.. QUICK DELIVERY HOME - READY FOR YOU TODAY. 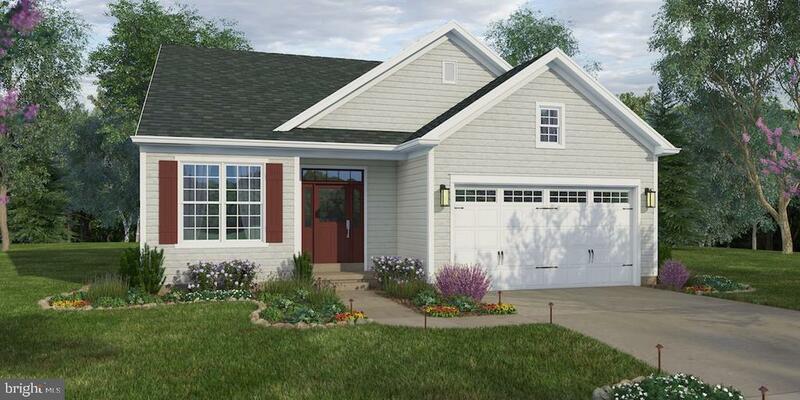 This home The Remington is a 3 bedroom, 3 full bathroom that includes 2,363 sq. ft. of living space. We added a loft with a bedroom and full bathroom that is great for family, friends, or overnight stays with the grandkids! An added sunroom, stainless steel appliances, ceramic tile in master and loft bathrooms are just some of the amazing features of this home! Our magnificent Clubhouse is situated in the heart of this thriving and vibrant gated community. Come and see just how wonderful it is to own a McKee Home. Model home hours: Monday, Tuesday, Thursday, Friday, & Saturday - 10:00am-5:00pm & Sunday from 12 noon-5:00pm - Please note that we are closed on Wednesday. Call appointment phone number for additional information." "Welcome to Woolwich Township ~ South Jersey~s best kept secret! 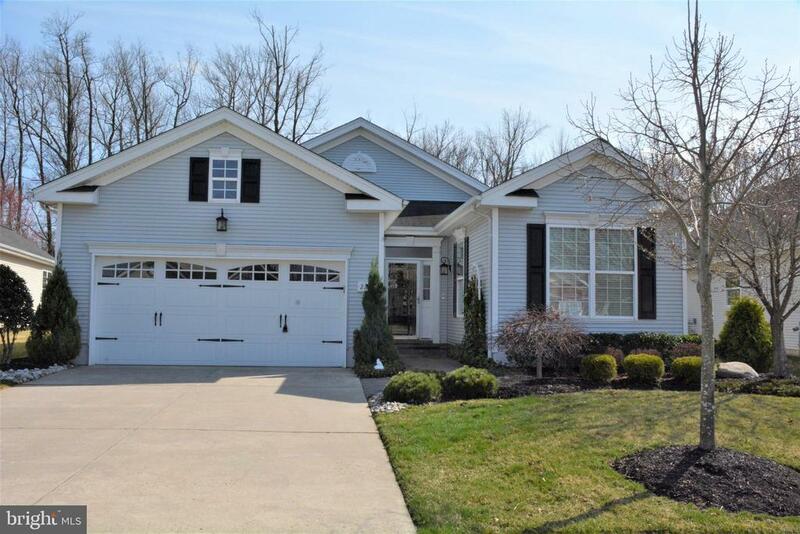 This 4 bedroom, 2.5 bathroom Saratoga model has been well maintained. An open 2-story foyer with dual staircase welcomes you into the home. The formal living room features cathedral ceilings and is open to the dining room with trim package and a beautiful chandelier with medallion. The kitchen features a large center island, pantry, recessed lighting, trim package, stainless steel appliances, work space, and breakfast area. Sliding glass doors in the breakfast area lead you to the deck and tree lined backyard. The family room features recessed lighting, gas fireplace, and trim package. For additional space there is a sunroom with a cathedral ceiling and a home office. The upper level features a master bedroom with en-suite bath, 3 additional spacious bedrooms, and a full bathroom. The master bedroom features a tray ceiling, sitting area, recessed lighting, and walk in closet. The en-suite bath features a double bowl vanity, soaking tub, and stall shower. Woolwich Township is close to downtown Swedesboro with restaurants, bakery, coffee shop, library, parks and recreation, only minutes away from Philadelphia, DE tax-free shopping, and major commuting routes. Great schools and location!" "Nestled on a quiet private road, this unique home is spectacular in every detail. Designed for entertaining, this home and it~s grounds reflect the lifestyle you deserve. 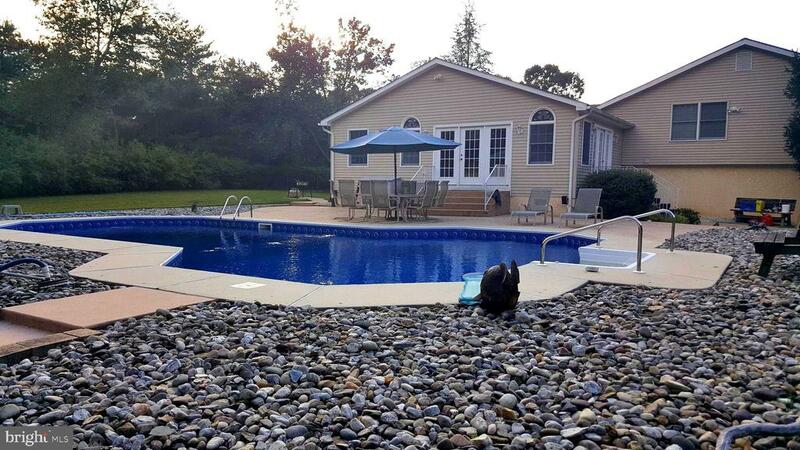 Summer is coming~Who needs to deal with traffic heading to the shore when your own backyard paradise is waiting for you?! The lush backyard will make every day feel like a vacation in a 5-star resort! Take a swim in the in-ground pool. Enjoy a barbeque with friends and family on the patio. This gorgeous yard has incredible resort-like landscaping and black estate fencing. This is truly your opportunity to enjoy the good life! Enjoy the privacy of the 1.32-acre wooded lot. The grounds include 2 sheds and oversized 3 Car garage with electric (Perfect for the car enthusiast or the handyman in the family). The first level of this multi-level home offers a true full in-law suite. The in-law suite has a private entrance through a covered porch (I love this! ), a large living room, full kitchen, private bathroom (handicap accessible with a wheel-in shower) and a large bedroom with tons of closet space. If you have a home business, this suite could be perfect for that use too! Head through the laundry room and there is a door (I don~t want you to miss this area) leading to the enormous basement storage area. Head up to the next level for the main living space. The spacious floor plan boasts a gourmet kitchen with an abundance of upgraded Nantucket white cabinets with pullout shelving, a giant walk-in pantry, wall oven, and tile floors. Keep the cook company at the granite top center island. The island has more cabinets and pretty shelving. Enjoy your first cup of coffee in the sun-drenched breakfast room. The sun room is open to the kitchen and is truly a spectacular room offering wonderful space for entertaining! This fabulous space boasts six French doors providing tempting views of the delightful backyard. Additional windows and skylights bathe this room in natural sunlight. The skylights can open to al"
"Welcome to Woolwich Township-South Jersey's best-kept secret! This incredible Linden Model is one of the largest in the community and is situated on one of the largest lots in the community of High Hill Estates. The beautiful, professionally landscaped exterior with freshly painted trim and shutters adds curb appeal to this 4 bedroom, 2 full bathroom, and 2 half bathroom home. The 2-story foyer with hardwood flooring leads you to the formal living room and dining room featuring crown molding and chair rail. The kitchen features a center island, work station, stainless steel appliances, 42 cabinets, and recessed lighting. The expanded breakfast area features an upgraded sliding glass door leading to the impressive maintenance free Trex deck with custom design with, lighted steps and railings(dusk to dawn timer), and natural gas hookup for a grill overlooks the fully fenced in professionally landscaped backyard. The expanded family room with bonus windows features a gas fireplace and recessed lighting. The study/office is ideal for the work at home employee or a separate office area. The second level features a master bedroom with en-suite bath, 3 additional spacious bedrooms, and a laundry room. The master suite features vaulted ceilings, sitting area, and a walk-in closet. The en-suite bath features a double bowl vanity, soaking tub with tile surround, stall shower, and water closet. The finished basement adds additional living space to this already spacious home. The basement features 9ft walls, custom painted walls, carpet & tile flooring, hidden basement storage with shelving, a half bathroom, and rough plumbing for a kitchenette. Additional amenities to include 20-year premium roof, all rooms hardwired for internet, custom window treatments, upgraded sump pumps, painted walls & floors in the garage, and 2 zone HVAC. Woolwich Township is close to major commuting routes, Philadelphia, Delaware, shopping, restaurants, and parks and recreation." "Welcome to Woolwich Township ~ South Jersey~s best kept secret! 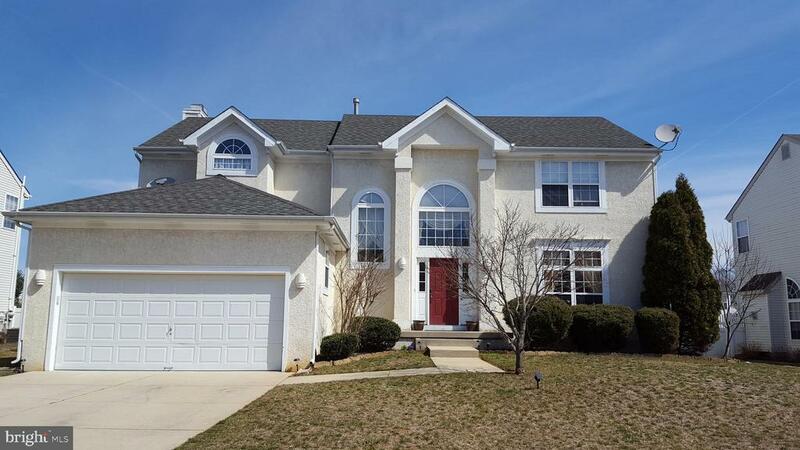 This 4 bedroom, 2.5 bath with partially finished basement has been well maintained! The eat in kitchen features 42~ cabinets, pantry, recessed lighting, and a sliding glass door leading to the stamped concrete patio and fully fenced back yard. The kitchen is open to the family room featuring a gas fireplace, crown molding, and recessed lighting. There is a formal living and dining room. The second level features a master suite with en-suite bath, 3 additional spacious bedrooms, and full bathroom. The master suite features cathedral ceilings, dressing area with vanity, cathedral ceilings, recessed lighting, and en-suite bath with soaking tub, stall shower, and double bowl vanity! The basement has been finished to accommodate an at home business and is ideal for an office, playroom, or exercise room. Additional amenities include solar panels, raised storage and work bench in the garage, hot tub, 5 zone sprinkler system, blown insulation in attic, and UV treatment on the windows. Woolwich Township has restaurants, parks and recreation, coffee shop, bakery, shopping, and is close to major commuting routes as well as minutes from Philadelphia and Delaware!" "McKee-Weatherby LLC. NEW HOME CONSTRUCTION. OPTIONS & PERSONAL OPTIONS AVAILABLE. 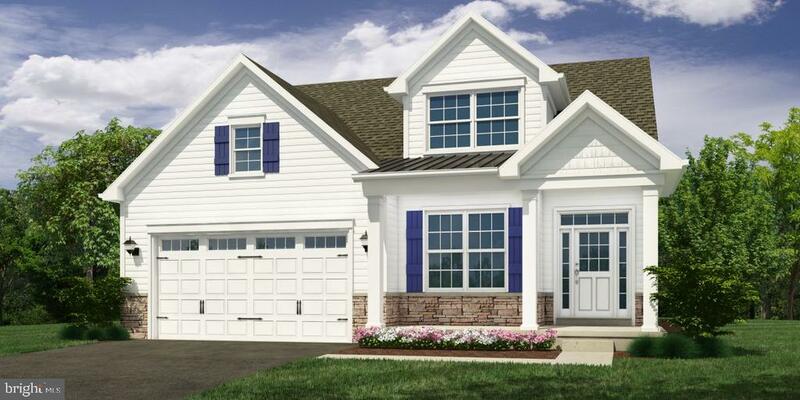 Welcome to The Preserve at Weatherby, McKee Builder's 55+ community located in Woolwich Twp, NJ. Each home in our community is Energy Star Certified and designed for comfort and easy living. Choose from 6 impressively designed homes all offering one floor living (however, 1 model features an already included Loft Area). Add Optional basement or Walk-out basement, 2nd floor additions and the ability to customize your home the way you wish to live. Two beautifully decorated model homes are available to preview. Each home we build offers, granite counter-tops, stainless steel appliances, 5 1/4 baseboard moldings, 3 1/2 door trim, wainscoting foyer entrance, double bowl vanity in Owner's bathroom, Architectural Shingle Roofing, and so much more. For those needing a home today, we are Offering 2 Quick Delivery Homes that are move in ready. Our magnificent Clubhouse is situated in the heart of this thriving and vibrant gated community. Come and see just how wonderful it is to own a McKee Home. Model home hours: Monday, Tuesday, Thursday, Friday, & Saturday - 10:00am-5:00pm & Sunday from 12 noon-5:00pm - Please note that we are closed on Wednesday. Call appointment phone number for additional information." "You'll feel right at home the moment you enter...This contemporary Captiva Loft home has an Open and Airy floor plan, with Inviting Warmth and Charm throughout. Enjoy the picturesque water view from the quaint front porch, and the sounds of nature from the back patio, with a pleasing tree-lined view. Experience the relaxed ambiance as you stroll from each delightful room with approximately 2763 square feet of enjoyable living space. This comfortable home features a Welcoming Entry Foyer, Open Concept Living and Dining rooms, Gathering room with a two-sided gas fireplace, awesome Gourmet kitchen with Breakfast bar, bright and cheery Sunroom, two bedrooms, two full baths on the main floor, one bedroom and bath upstairs, and a main floor Study/Office. The Expanded Main Bedroom with Bay Window features a splendid upgraded bath, and two walk-in closets. Beautiful flooring, Special touches and Neutral Hues will make decorating throughout the home a breeze. Come upstairs to the Amazing spacious Loft, including the third bedroom and bath, and storage area(s). Additional amenities include a main floor laundry room and two-car attached garage. Experience the Lifestyle this Community has to offer; socialize at the Clubhouse, relax at the Inground pool, enjoy a game of cards or tennis, exercise in the fitness room...Truly a Special Home, situated on a Fabulous lot, and in a Wonderful Community. Welcome To Your New Home! Note: All Dimensions are approximate. Sale contingent upon owner finding suitable housing." "This stately 4BR/2.5 bath home situated in the prestigious Lexington Hill development offers a wonderful spacious layout which will adapt to any lifestyle. Enter the front door to a sun drenched living room and enjoy the cathedral foyer with circle top windows and hardwood flooring throughout. The formal dining room offers great space for holiday gatherings while the eat-in kitchen with a cheery breakfast nook and island boast an abundance of oak cabinets, tile flooring, gas cooking and full pantry. A short step down opens to the spacious family room with vaulted ceilings, hardwood flooring, accent lighting and gas fireplace. Sliding glass doors to the deck allow easy access to the large yard to enjoy grilling or outdoor entertaining. Convenient first floor laundry room and half bath complete this level. Upstairs, you will find double doors to the master suite with a vaulted ceiling, large walk in closet and master bath with a tastefully tiled soaking tub, stall shower and double sink vanity. Enjoy hardwood flooring throughout the entire second floor with three additional bedrooms and full, freshly painted hall bath with double bowl vanity. The Full (25~X27~) basement offers more potential to expand your living space even further down the road while the expanded 2 car garage offers more than enough storage space. Don't miss the chance to visit this wonderful home in the acclaimed Kingsway school district- located conveniently to all major arteries and bridges to Delaware, Philadelphia, NY and the shore!" "Move right in to this roomy, immaculate and sunny home! A covered front porch welcomes you home. Enter the two story foyer graced with lovely and durable tile floors and a side turned extra wide staircase. Family meals and entertaining are a snap in the sunny kitchen offering an abundance of oak cabinets, gas appliances, and a pantry. Keep the cook company at the center island! Have your first steaming cup of coffee in the sundrenched breakfast nook. On chilly nights, curl up by the cozy gas fireplace in the family room. The family room offers neutral carpet, a ceiling fan and recessed lighting. Host your next holiday meal in the formal dining room graced with crown molding, neutral carpet and a sunny walk-out bay of windows. The formal living room is currently used as a convenient first floor office. Back behind the kitchen and first floor laundry is a bonus room. This space is perfect for a playroom~an office~an exercise room~whatever you need! The master retreat has a large bedroom with elegant shadowbox molding, vaulted ceiling with recessed lighting, two walk-in closets and neutral decor. Pamper yourself in the spa-like master bath. At the end of the day~close the door and relax in the large corner jet tub. The additional bedrooms are spacious with generous closet space. Additional amenities include: neutral carpets throughout, a huge basement (just waiting to be finished into a man-cave); fresh neutral d~cor, lawn irrigation system and more! Check out the highly-rated Kingsway schools. 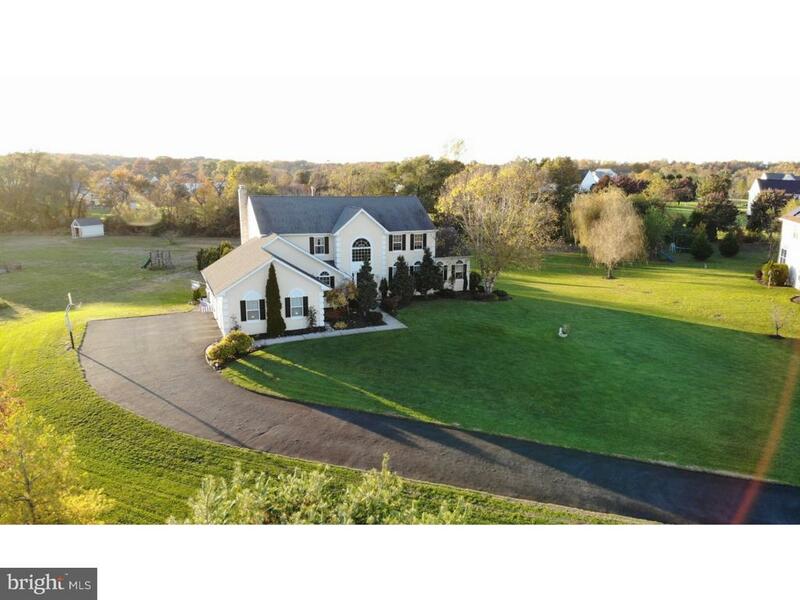 Enjoy an easy commute to Philadelphia, Delaware County, Cherry Hill, Delaware and more." "This home is breathtaking inside and out and the amazing details and care are incredible. The location provides a wooded backdrop offering privacy, wildlife viewing and mature landscaping as you enjoy your over sized paver patio. As you enter the foyer area you will immediately notice the interior is equally inviting offering beautiful upgraded hardwood flooring, open floor plan and high ceilings. Other highlights include, gas fireplace that is flanked with built in cabinetry, recess lighting, ceiling fans, custom painted walls and newer carpeting. The kitchen features endless granite countertops with upper bar area, new stainless steel appliances, tile flooring and 42 inch upgraded maple cabinets with pull out drawers. The decorative arched windows allow sunlight to stream through most of the home while sun room provides a bright enjoyable area to read or relax. The master suite offers 2 large walk in closets, a newly remodeled master bath with seamless glass shower doors, whirlpool tub, dual sinks with upgraded cabinets and tile flooring. Both the front bedroom and adjacent study are nicely sized. Additional updates include newer central air unit (Carrier - 4 yrs. old), whole house humidifier and a loft which provides a convenient storage area over the garage, newer insulated garage doors with openers, 75 gal H/W tank, paver walk ways and more. This is a showcase home do not delay in scheduling an appt."